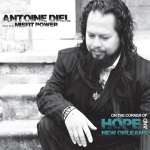 Vocalist Antoine Diel quietly, though with great expressive elegance, opens On the Corner of Hope and New Orleans with a heartfelt rendition of the moving “His Eye Is on the Sparrow.” Accompanied solely by the lovely guitar of Daniel Schroeder, it is instantly apparent that Diel is a man of great talent and soul. Born in Manila, the capital of the Philippines, and raised in Los Angeles, the New Orleans resident reveals his experience in operatic and theatrical settings while showing his full embrace of his new hometown. This comes through most strongly on his original, “Animal’s Testimony,” which begins as a gospel sermon, gets into a dirge mode before the rhythm picks up and, as the lyrics rejoice, “they were dancing in the street.” On this tune, Diel’s got the full band behind him, including such notable brassmen as trombonist Craig Klein and trumpeter Kevin Louis. Diel truly goes back in history for “Louisiana Fairy Tale,” a tune written in 1935 by John Frederick Coots. Tom McDermott, a pianist with great appreciation and flair for playing in this light-hearted style of the era, matches well with Diel’s of-another-time vocal tones. On tunes like Tom Waits’ “Strange Weather” and the following, tango-infused “It All Ends the Same,” Diel’s exacting, formal elocution and delivery would seem to fit more comfortably on a theater’s stage than on a bandstand. Not to say that with his skills he couldn’t do both. For the album’s purposes, Diel fares best when he’s most relaxed. Again, this is found on an original composition, “I Hear Mama Sing (Luna’s Song).” It’s written and sung from the heart, a requirement of all good music. The album swings out happily and really pleasantly in a duet with Diel and vocalist Arsene Delay on “Bless You (For the Good That’s in You),” made popular by singers Mel Torme and Peggy Lee. Now that’s diggin’ into some old school.